"Learning and teaching should not stand on opposite banks and just watch the river flow by; they should embark together on a journey down the water." For 2-year-olds and older 1’s nearing age 2. Student-to-educator ratio is typically 6:1. 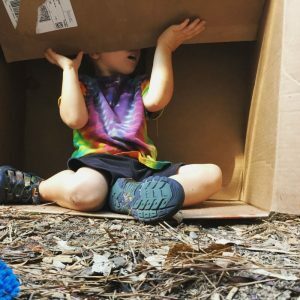 Turning Sun’s Preschool Level 1 Class builds upon the environment and curriculum from TSS’s Toddler Class. The children are greeted daily with beautiful and engaging invitations for exploration and play. 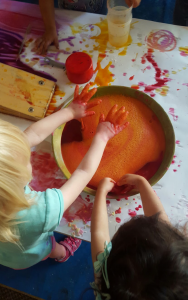 Children have the choice to play with and explore many different materials and can work in small groups or independently. Every morning, we have a morning meeting where children are invited to draw in their sketch books and sing songs. Turning Sun educators introduce a new material or skill, such as building tall with blocks, using an allen key, or modeling conflict resolution. Like all Turning Sun classes, the Preschool Level 1 class uses the project approach. Whether the children are discovering the world of insects around us, exploring their emotions through persona dolls, exploring local farms and farmers, drawing in their sketch books, exploring ramps or tools, each day is a part of the journey in their class project. Experts are also brought in to further experiences and deepen the learning. The Preschool Level 1 class also enjoys regular yoga classes, music classes, and garden time with TSS’s Environmental Educator. "Potty training can really be stressful, and I appreciate that Turning Sun allowed my child to potty by herself when she was ready."